Barnsley chief executive Ben Mansford has revealed that former Halifax captain Marc Roberts rebuffed more lucrative offers from rival League One sides to join the Reds. 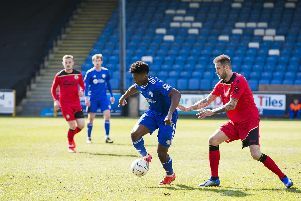 Roberts has signed for his home-town club on a three-year-deal after coming to the end of his contract at The Shay and is Barnsley’s first close-season signing. Mansford said of the 24-year-old defender: “We made a bid last summer, which was turned down and we have tracked him ever since. “In the second half of last season, by his own admission, his form dropped off a bit. “But we have seen enough of him that, with full-time training, he has plenty to offer. “He is a Penistone boy and feels an affiliation for the club and wants to play for us.